Arion.Net is where I post random thoughts once in a while and document some of the projects and hacks I've worked on in my spare time over the years. All opinions posted here are my own and don't represent those of my employer. While I was at Blackhat and Defcon in 2002, I decided it would be cool to create an image collage that reflected what people were doing with their computers while connected to the wireless networks. I hacked some programs together and ran a sniffer for a few hours at both Blackhat and Defcon which collected about 40mb of GIF and JPEG files from the ether. After hacking some more programs a bit, I was able to generate some cool pictures from this raw data. Ever since I started my first job in Northern Virginia, I've noticed that there was an obscene amount of vanity license plates. You know, license plates that you can get from the DMV with your own personalized saying. Well, I started keeping track of all the ones that I saw, but quickly gave up. There were just too many! And, boy were there some really really dumb ones. So, I decided to shift my focus to seeing how many geek related personalized plates I could spot and keep track of. Back in the day, I had a Honda Civic. Alas, it has been put to rest. This is the sad (but amusing) story of my old Honda -- the history and "features" of my infamous vehicle. My good friend Dave was available to help me document the last days of this fine vehicle. 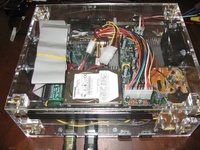 In 2005 I attempted to build a car-ready XBOX + XBMC system for playing digital audio. I finished it, but never got a chance to actually install it in a car. Oh well. It was a fun project and I've done my best to at least document it here a little. New Post After Long Hiatus!